I have a relatively long list of macaron flavours I want to make. Pistachio is one of them, though not really on the top. However, I moved it up the list as S’boss (a French-Australian) requested for some. Pistachio (Pistache) Macaron is one of the classic French flavour. I remember seeing macaron packs at CostCo (imported from France) with presumably four classic flavours and pistache is one of the four. The rest of the flavours are vanilla, chocolate and raspberry. I followed the pistachio butter cream recipe from Jose Marechal’s Secrets to Macarons. The filling was made of ground pistachio mixed with butter and sugar, which produced relatively dry filling. I also substituted part of almond meal with ground pistachio in the macaron shell. The creamy, sweet and nutty aroma of ground pistachio was wonderful. It was even more so when the macarons were being baked. It filled my house with fantastic aroma. Pistachio macarons stayed crisp and dry for longer due to its relative dry filling. It also froze well. However, if you’re one of those who like moist macaron, you probably don’t like it. On the other hand, this version of pistachio macaron will be ideal for crisp macaron lovers. The macarons had well-raised feet. I started to believe that mixing other ground nuts with almond meal gave better-formed macaron feet (the Snickers Macaron I made with ground peanuts also produced well-raised feet). These were one of the best feet I had so far. More details on Basic Mararons using Italian Meringue techniques can be found here. You can also see more detailed intructions on making macarons in my Basic Macaron Recipe and I heart Macarons blogs (however, they are recipes using French meringue method. Most of the processes are similar between Italian’s and French’s. The only difference is the handling of sugar and egg white). 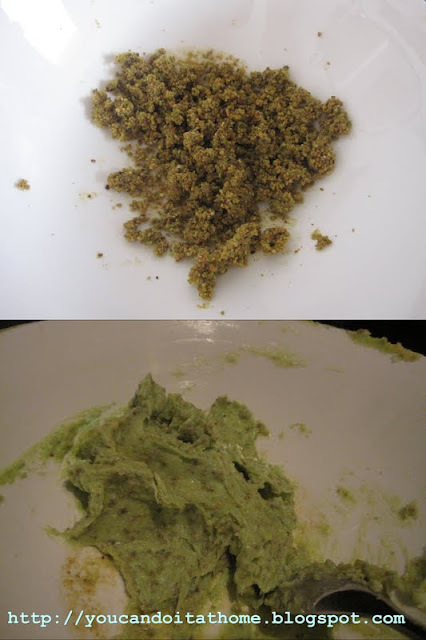 Note: To make pistachio paste , grind pistachio very finely in a food processor and add 2 teaspoons of sugar syrup to the nuts until combine and a thick paste is formed. Sift almond meal, ground pistachio and icing sugar together through fine sieve and set aside. Divide egg whites into two equal portions (50 g each portion). Pour one egg white portion (50 g) into the almond meal/icing sugar mixture. Add colouring powder or liquid to the mixture. Don’t mix or stir them, just leave it as is. Put the water and caster sugar in a heavy-base saucepan over medium-high heat. When the syrup starts to boil. Place the rest of egg white (50 g) into a mixing bowl, using the whip attachment, whip egg white to the soft peak. When the syrup reaches 118°C (on a thermometer), take if off the heat and let it cool down to 115°C (or until the bubbles slightly subside). While the mixer is still running, slowly pour the sugar syrup down the side of the bowl. Be careful not to pour syrup onto the whip as it might spatter. Continue mixing until the meringue cool down to slightly above body temperature (50°C) or when the side of the mixing bowl is just warm to touch. The whipped egg white will be (very) stiff and glossy. Mix a third of whipped egg white into the almond meal mixture and combine them well. At this step, I work the mixture very vigorously to blend the egg white with almond meal mixture. Fold the rest of whipped egg white into the mixture and mix well, yet gently, until the batter is smooth. The batter will be thick. It resembles a very thick cake batter, or as many web sites describe it as a magma-like consistency (I believe it means the thick batter would flow slowly like a magma). Put the mixture into a piping bag fitted with 1-cm plain tip (size #11). Pipe the staggering rows of 1-inch rounds onto baking trays lined with parchment papers or baking sheets. You will need two trays for this recipe. Let the piped shells stand at room temperature for 30 – 60 minutes to let the crust forms. This depends on the room temperature and humidity. When the piped shells are dry to touch without it sticking to your finger, they are good to go into the oven. Preheat the oven to 160°C (fan-forced or convection oven, increase the temperature by 20°C if you’re using conventional oven) for at least 15 minutes. Just before baking, turn the temperature down to 150°C and bake the macarons for 15 minutes. Lift the baking papers/sheets off the baking tray to the cooling rack and let it completely cool down before removing macarons (it is easier to remove cool macarons off the sheet. They are also less likely to stick to the paper). Sandwich cool macaron shells with pistachio buttercream filling. Store macarons in airtight container in the fridge. Macarons will taste better after they are chilled overnight as the filling flavour will blend in and shells will be less dry. Beat the softened butter using a whisk or an electric beater, to obtain a smooth and creamy texture. Add the icing sugar and beat again. Finally, incorporate the pistachio paste, then beat again for a few more minutes to aerate cream and give it lightness. Set this aside, it is not necessary to chill the buttercream as it is a firm filling. Green tea pistachio sounds interesting. Whole ground pistachio in the macaron batch also made me curious.